As you’re checking out the online sales this month, feast your eyes on some floral fashion beauties that caught my eye, including a super versatile wrap dress, fun floral heels from Sam Edelman to take you dancing, and who doesn’t love floral fashion by Johny Was?! Don’t you love this statement jungalicious chair by Selamat Designs? So grab a chilled lemonade, relax and smile. Happy Friday! Let’s not panic! We have Christmas gift ideas for everyone, so make your list, check it twice, and shop local where we’ll gift wrap for you, feed you cookies and you can relax by petting, Duke, our shop dog. Find more ideas here. Perfect for he/she who totes things like dry cleaning, fresh market veggies and more! Let us help with your holiday gifting and entertaining needs. You’ll be glad you did! 200 Years of Fashion History on Exhibit in Atlanta! A couple of weeks ago, Steve and Jill, along with a neighbor visited SCAD’s “Threads of History” exhibit, currently on view through March 19, 2017 at the SCAD FASH Museum of Fashion + Film in Atlanta. The trio absolutely adored it and we wanted to share it with all of you – along with a giveaway of five general admission tickets! Beautifully curated, this exhibit is guided by very knowledgeable student docents who add in depth details, which truly bring the garments to life. The craftsmanship that went into the accessories on showcase is absolutely awe inspiring. While this may not be your typical museum exhibit, fashion is certainly an art form! The above images share some garments that symbolize the shortening of hemlines at a time our culture was in a season of change. Aren’t they lovely?! This is a sartorial voyage through style and time celebrating the power of fashion and its capacity to reflect historical and cultural trends. Featuring rare European and American garments from the 18th through 20th centuries, the exhibition illuminates society’s shifting values as it traces the evolution of historic dress. “Threads of History: Two Hundred Years Fashion” offers viewers the unprecedented opportunity to examine womenswear, menswear and children’s ensembles from a range of distinctive periods, from the ornate Rococo era and the grand Belle Époque to the glitzy Roaring ’20s and the elegant New Look revolution following World War II. Many of the garments on display appear courtesy of world-renowned Italian fashion professor and collector Raffaello Piraino, whose legendary collection, housed in Palermo, Italy, consists of more than 5,000 garments and accessories that belonged to the Sicilian aristocracy and bourgeoisie. Notable items from the SCAD Permanent Collection punctuate the exhibition. And, for our local Atlanta friends, the SCAD FASH Museum of Fashion + Film is accessible in the heart of Midtown and offers (bonus!) easy parking. While the “Threads of History” exhibit is included in general museum admission and is worth every penny, we’re thrilled to offer five you of a chance at winning free admission! Simply enter using the widget below and winners will be randomly selected on Monday, December 19th – good luck!! We can’t wait to hear what you think of the exhibit, so please share a comment if you visit SCAD FASH or let us know next time you’re in the steve mckenzie’s showroom. Last week, Steve and Jill visited the SCAD FASH Museum of Fashion + Film for their “Refined Irreverence” exhibition, celebrating fashion industry icon Carolina Herrera and the 35th anniversary of the House of Herrera. As we’ve shared before, Steve and Jill are both high fashion appreciators, and in the business of interior design, many times what’s currently working in the fashion world will translate into what will be trending in the world of interior design. Needless to say, this exhibition was inspirational on so many levels! Presented by the SCAD FASH Museum of Fashion + Film and the SCAD Museum of Art, this exhibition marks the first museum showing of Herrera’s work. Featuring new and vintage designs from Herrera’s 1981 inaugural collection to the present, “Refined Irreverence” includes more than 75 garments showcasing the designer’s modern, dynamic classics. Since launching her first collection in 1981 at the behest of legendary Vogue editor Diana Vreeland, Venezuelan-born Herrera has become synonymous with effortless elegance and modern refinement. “I have a responsibility to the woman of today — to make her feel confident, modern and above all else beautiful,” Herrera said. Curated by Rafael Gomes, SCAD director of fashion exhibitions, “Refined Irreverence” includes runway looks, day wear, and bridal and red-carpet gowns worn by Michelle Obama, Taylor Swift, Lady Gaga, Tina Fey, Renée Zellweger and Lucy Liu, as well as ensembles from Herrera’s personal collection. “Refined Irreverence” is curated by Rafael Gomes, SCAD director of fashion exhibitions. Herrera’s designs are classy, comfortable and certainly functional – her use of pockets is brilliant and it’s obvious that to her (and we agree) – white blouses rule! She experiments with new materials – digitally printed fabrics, printing on squares of foam, connecting them to build an amazing, large floral bridal skirt. Her appreciation for unique materials and how they work to create new fashion is evident and makes us want to be even more forward thinking with our own textile and interior designs. Isn’t this a lovely sentiment? And it’s obvious, based on this exhibit and her work over the years, she is achieving her goal. “Refined Irreverence” is running through September 25, 2016 and we urge you to make a trip to SCAD FASH and experience Herrera’s work for yourself in this outstanding exhibition. As many of you know, what’s trending in fashion oftentimes predicts what will be hot in interior design… Take that fact, and Jill’s love for fine quality, unique clothing, and you have an idea where steve mckenzie’s appreciation for high end fashion comes from. Recently, we hosted a pop up shop for Hampden Clothing, undeniably one of the country’s top boutiques, whose brick-and-mortar location is located on Charleston’s historic King Street. Hampden Clothing owner, Stacy Smallwood, was along for the pop up, and we took the opportunity to pick her brain for all of you! Which words best describe your aesthetic/style? I’m not really attached to outfits – it really depends on my mood. I’m so busy, it’s hard to remember! I travel so much, so I know my go-to pieces, pack them, and know they work. Tip – Stacy’s favorite staple item is a good blazer. It nips in at the waist without being a belt. What are the sources of your inspiration? Travel! When traveling, you’re able to see what others are really wearing. In our day to day lives, we see the same people and same looks – this can be conforming. Who are three people, alive or dead, you would invite to your dream dinner party? Rene Brown – Obsessed with her right now! Creativity, and vulnerability. We see so much vulnerability in the dressing room; it gets really raw when women look at themselves in the mirror. Gwyneth Paltrow – Lifestyle and food. Chelsea Handler – Have fun! What are some pieces in your wardrobe you can’t live without? A good bag and good shoes – finish the look! Are there any rules you follow when pulling a look together? It’s all about proportion. If you wear a flowy top, choose a skinny bottom and vice versa. Don’t limit yourself by age, but be appropriate. Take your cues from your peers and peer media, not your teenagers. If you’re limiting yourself with your wardrobe, where else may you be limiting yourself?!? For fall, underlying Bohemian style. Velvet, burgundy. Cold shoulder and off the shoulder continues. 90’s rocker girl – chokers, plaid, monochromatic. Red. Turtlenecks – in the south find a tissue weight short sleeve option to pair under a sleeveless summer dress and bring it into fall! If stranded on a desert island, what’s the one thing you couldn’t live without? What’s a piece of advice you’d share with someone looking to break into the fashion indistry? You don’t need a fashion degree – get a business degree! Find a good mentor and polish up your math skills. THANK YOU to Stacy and Hampden Clothing for gracing our showroom with your pop up shop and for this fun interview – it was such a treat hosting them all here and learning more about Stacy!! Sidenote – Stacy and Hampden Clothing are part of a select board, which Harper’s Bazaar works with to determine what may be featured in the magazine. Pretty awesome, right?!? We hope Stacy and her thoughts on fashion have inspired you to reconsider your wardrobe a bit and how it works for you! Elegant sophistication has never been so apparent in a person as it is in our new friend – and Men’s Style Concierge – Chris W. Joseph. We’re so grateful to have recently been introduced to Chris, a definite trendsetter, and fellow Atlantan. We invited him to be a Tastemaker here on the blog for steve mckenzie’s, and happily, he agreed. Chris W. Joseph has established himself as a trusted lifestyle resource for today’s discerning gentlemen. Chris has become a valued and indispensable wardrobe consultant to his clients by developing and facilitating strategies to refine their physical appearance & presentation. In addition, as the Men’s Style Concierge, Chris is a proven authority on men’s style; thousands have connected with him through various social media platforms, such as YouTube, Facebook, and Instagram. Both men and women follow his perspectives on luxury style trends found in popular culture within major US markets and around the world. The Men’s Style Concierge offers image consulting services to individuals, corporate entities, and non-profit groups. All custom accessories created by the Men’s Style Concierge, such as pocket rounds (available at steve mckenzie’s), lapel pins & flowers, and cufflinks, are handcrafted using quality materials and fabrics. The ultimate purpose of the Men’s Style Concierge is to explore the best in men’s style tips, fashion advice, grooming techniques, contemporary etiquette, and much more to help you achieve the most from your personal look & brand. Chris is Haitian-American. He was born and raised in Miami, FL, but currently lives in the Atlanta, GA area with his wife and two young children. 1. What are three words that describe your aesthetic? My favorite project to date was being able to style the guys in my fraternity brother’s wedding. The bride didn’t want the tuxedos to be too “out there,” so we opted for traditional black, with handsome accessories… and Jordan sneakers to add an element of fun for the guys. 3. What’s the source of your inspiration? I’m inspired by a lot of different sources: nature, art, the old & new styles, music, and those feelings that come from deep inside of me that know one else would ever know. 4. Name three people – alive or dead – you’d invite to your dream dinner party. Sam Cooke, Brad Pitt, and a young Muhammed Ali. 5. Please share with us a garment or accessory you couldn’t live without. I couldn’t live without a white handkerchief… My father always carried a cotton hanky with him where ever he went. He used to either wipe sweat from his brow, blowing his nose, or cleaning a stain from his shirt or tie. Because I saw him do those things all throughout my childhood (and he still uses a hanky), it’s something I’ve done since college. 6. Do you follow a particular set of rules when mixing textures, colors, etc. – how do they work for you? I don’t necessarily follow style rules when mixing textures or colors. However, I don’t follow the rule of when wearing multiple patterns, I try to wear those patterns in proportion to one another… And when I wear similar patterns, those patterns are in various sizes. I’m currently into sport coats with elbow patches. I’m completely over suit jackets with three or more buttons – guys please stop it! 8. What would be the one thing you would have if you were stranded on a deserted island? If I were stranded on a deserted island, the one thin I would have is my trusty Swiss Army pocket knife. I think I could survive if I had that. 9. Please share a piece of advice you’d offer to someone looking to break into your industry. I advise anyone looking to break into the image or styling/fashion industry is to be prepared to hear a lot of “No’s” and to work hard. Also, I’ve found that because I love what I do, the hard work I put into my brand isn’t hard at all because I enjoy it! We agree – all the hard work is worth it when you love what you do! Doesn’t Chris seem like the nicest guy?? If you’re in the market for a stylist, or just looking for some friendly advice, we encourage you to reach out to the Men’s Style Concierge and see what they can do for you and your image. And thank you again for Chris for sharing a bit about him and his business with us as this month’s Tastemaker! Ever wear something for an entire year in the name of research? No? Just us then… Well, it was all in the name of fashion, fabulous design, seamless functionality, and, of course, you – the steve mckenzie’s client! 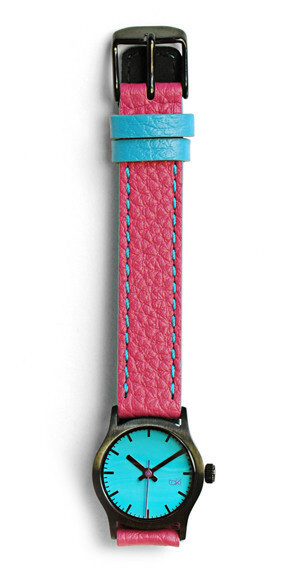 And we’re so glad we devoted our wrists to Taki watches for a year (now, going on two), because now we can say with utmost confidence: WE love Taki watches and know you will too! 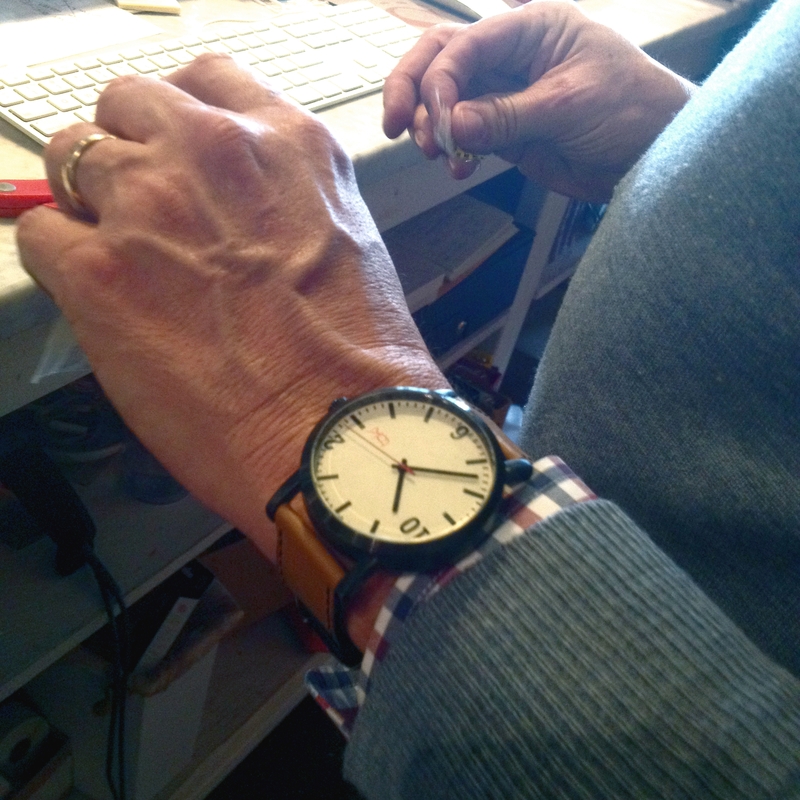 Steve sporting his Taki watch in-store! 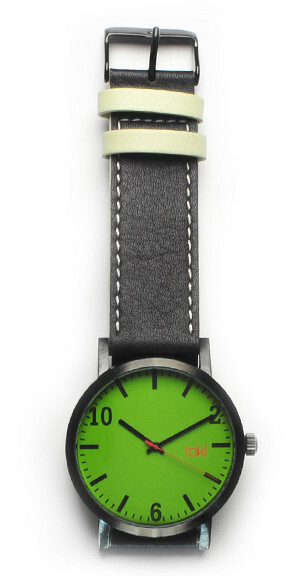 Not only do Taki watches provide a perfect pop of color to your wardrobe, feature super-comfy leather straps, and keep perfect time, thanks to a Japanese time-keeping mechanism, they’re totally affordable! And anyone aged 13 to 93, give or take a few years, is sure to love them as well. Taki’s clean lines are ideal for everyday-wear, and because they’re so affordable, you can collect a variety of colors, so you’ll have something to coordinate with practically every ensemble. It also doesn’t hurt that Taki Designer, David Spencer, shares our love for Scandinavian architecture and design. We knew there was a reason we were so drawn to his fabulous designs! Come into steve mckenzie’s today to check out our collection of Taki watches and give one a try for yourself – chances are, you’ll be walking out with it on, you’ll love it so!